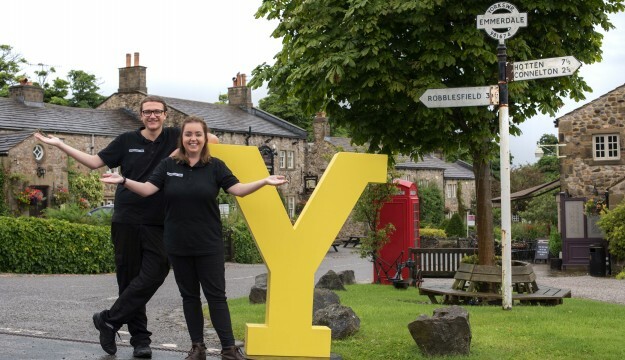 Emmerdale Village Tour guides Jack Gillies and Bex Grant on the iconic outdoor film set with Welcome to Yorkshire’s big Y logo. Today is Yorkshire Day and to celebrate Welcome to Yorkshire has taken its iconic Y logo to the set of the county’s legendary soap, Emmerdale. Welcome to Yorkshire has joined Emmerdale to celebrate this special date which has been recognised for more than 40 years and is now bigger and better than ever. Yorkshire Day was first celebrated in 1975 by the Yorkshire Ridings Society, and the date marks the Battle of Minden in 1759 and the emancipation of slaves in the British Empire in 1834 – a movement led by MP William Wilberforce, from Hull. And millions of people will today celebrate all that’s great about Yorkshire across the four corners of the county. This year’s official Yorkshire Day celebrations take place in Sheffield with a parade of the county’s civic dignitaries from the city’s Town Hall to Sheffield Cathedral in time for a service at 11am. Halifax is marking Yorkshire Day with the re-opening of the beautifully restored Piece Hall. The Grade I-listed building is the only surviving 18th century cloth hall in the UK and one of only a handful across the whole of Europe. Xscape Yorkshire in Castleford is marking the day with a unique Yorkshire vending machine. Everything it dispenses is from God’s Own County from Yorkshire puddings and Yorkshire Tea to Seabrook Crisps and Welcome to Yorkshire’s sought-after Y badges. Wentbridge House in Pontefract is hosting a family fun day in support of the Yorkshire Air Ambulance with special guests Geoffrey Boycott OBE, Doncaster’s Britain’s Got Talent finalists The Pensionalities, and Yorkshire vet Julian Norton. The White Rose flag will also fly high at Pontefract Castle where visitors can learn all about Yorkshire soldiers through the ages. Otley’s Pub Club will be making a special draw this evening to match some Yorkshire celebrities with each of its 21 local inns. The pubs will temporarily change their names to that of the celebrity they get paired with, so you could end up drinking in the Sean Bean, the Dame Judi Dench, the Lizzie Deignan or even the Welcome to Yorkshire’s Sir Gary Verity! The organisers will spend the next 12 months tracking down the famous faces to persuade them to take a drink in their named pub on Yorkshire Day 2018. In Filey, everyone is invited to take part in the traditional Yorkshire Declaration of Integrity at the Memorial Gardens in Murray Street. The Deputy Mayor and Mayoress and the Town Crier will lead the ceremony followed by the laying of a wreath to remember those Yorkshiremen who fought and died in the Battle of Minden against France in 1759.